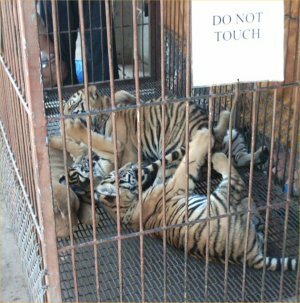 The wild city of Bangkok, touching tigers and a visit to the bridge on the river Kwai. 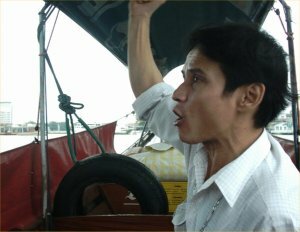 Our guide Adam, takes the lead, as we speed across the Chao Phraya river, in our private boat, long tailed boat. We visit the Royal palace and tour the grounds. Completed in 1782, its magnificence cant be overstated. 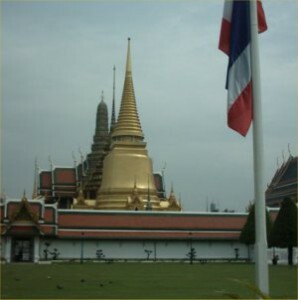 Wat Phrakaewhe – The temple of the emerald Buddha. This is the most sacred temple in Thailand. The Buddha is actually made of Jade or Jasper. It was not possible to take pictures inside the temple, so I got this shot of it from outside the door. 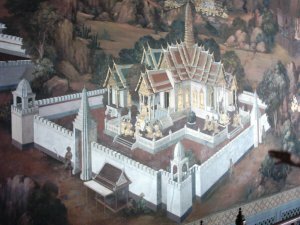 The emerald Buddha has been the cause of many wars throughout the history of that region. 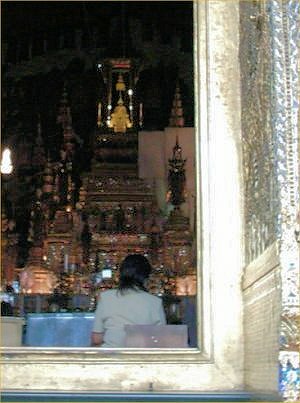 The robes on the Buddha, are changed 3 times a year by the King, personally. 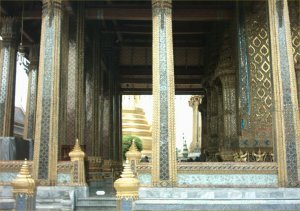 The Royal palace is an astounding collection of 100 buildings, Golden spires and glittering Mosaics. One of the many wall paintings, within the Royal Palace. 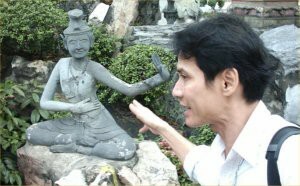 Statue of a hermit, the traditional symbol of medicine. One of the most stunning sites of the whole trip. 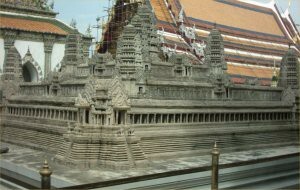 An exact replica of the Angkor Wat (the oldest temple on earth) in miniature. Wat Po, the temple of the reclining Buddha (actually, the largest reclining Buddha in the world). 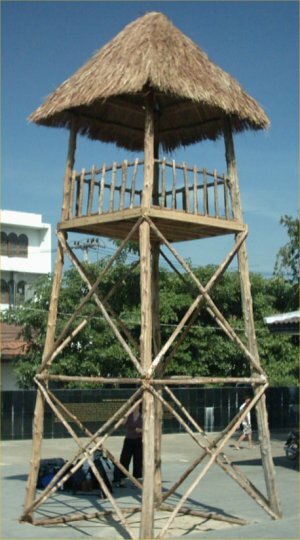 Built in the 17th century, it is 48m long and 5m high and gold plated. Due to the design of the building it is impossible to get a picture side on. The feet, contain the traditional 108 Auspicious sights of a true Buddha. 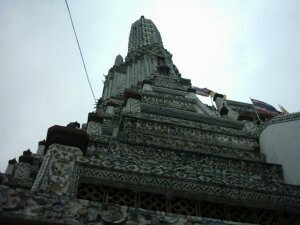 Wat Arun, the temple of dawn. Chinese ships visiting the Siamese capital, would use porcelain as ballast. As an ancient form of environmental friendliness, the ballast would be used for decoration, rather than just thrown in the River. We were allowed to climb to the first level but the 2nd and 3rd were closed. As we head back to our long tailed boat, our guide “accidentally” takes us into an alley full of souvenir shops and hawkers. We get out of there as quick as we can, and continue our journey. Our tour continues through the waterways of Bangkok. 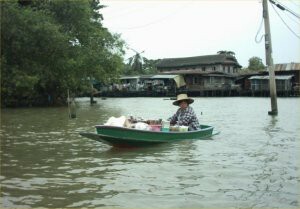 We wanted to see a floating market. Unfortunately, companies like Tesco, have largely destroyed this type of commerce. This was the only trader that we could find when we visited one of the more famous areas. This section of the river had hundreds of fish in it. 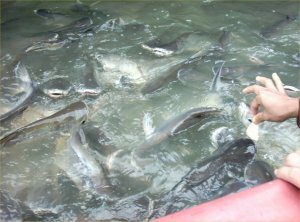 There was no need for a fishing rod, you could literally put your hand in the water and pull them out. We stayed around the Nana Plaza. The traffic in Bangkok is horrendous, so staying at a hotel near the Sky train was essential. 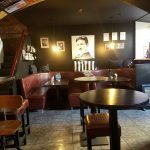 In the evening, we go out to a local bar for some entertainment. This local bar owner, had a superb Tie with a dollar bill on it. 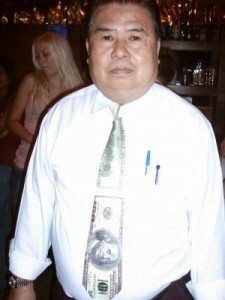 A Thai wearing a Tie. 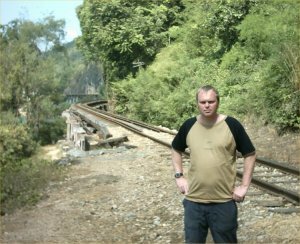 Next day, off to visit the bridge on the river kwai. Had to get up at 6:am. On the way we visit a sort of Safari park and see tiger cubs. 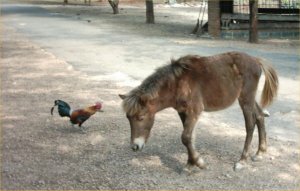 A horse and a cockerel “make friends”. The highlight of the trip, we got to sit with some real Tigers and touch them. 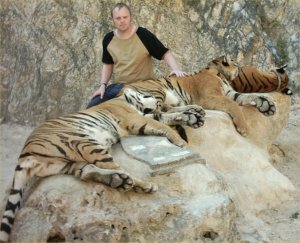 This photo isn’t a fake, I am actually sat with 3 Tigers (there was no-one nearby with a gun or anything, if they “lost it”, I was dead). A real trip out of the comfort zone. 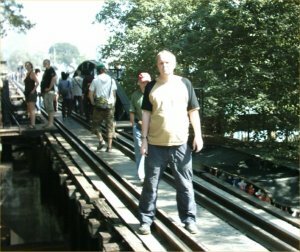 A trip to the world famous Bridge on the river kwai. This is the bridge across the river, built later by the Thai Government. Kanchanaburi cemetery, where some of the 13,000 people, who died building the original railway, are laid to rest. On the trip with me, were a brother and sister from Sweden. Together we found a grave, of someone from The Manchester Regiment. 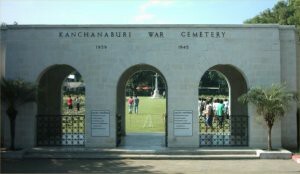 The cemetery contains most of the people who died building the bridge, except for the Americans, who were repatriated. There were Japanese tourists everywhere, who were smiling and taking pictures, without a hint of irony. After this, we visited the JEATH museum. This stands for Japanese, English, Australian, Thai and Holland. The museum is designed in the shape of a hut, of the kind prisoners would sleep in. 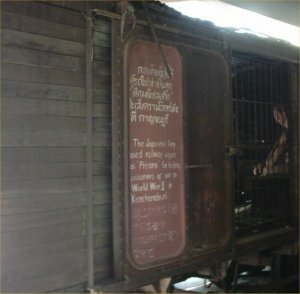 There were many pictures and artefacts inside, including this train carriage, used for transporting prisoners. Cholera was the main killer. It was said that a person that contracted this illness, would be unrecognisable to friends 2 hours later. 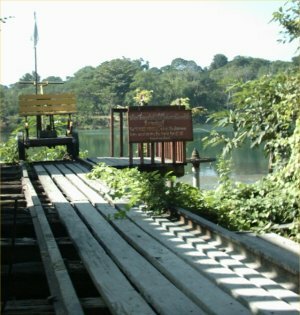 A section of the original bridge. Only around 50m long, its all that remains of the original, that cost so many lives. 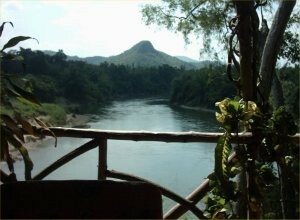 In the book/film bridge on the River Kwai, the the bridge is made from bamboo, and other stuff like that. In reality it was built from concrete, wood and steel. Not surprising really, considering as a fiction writer, he was also the Author of planet of the apes ! In reality, the bridge was destroyed by Allied bombers, and not by Commando’s. 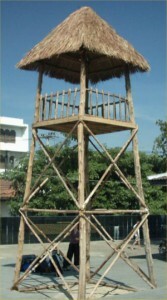 A replica of one of the Japanese watch towers, that overlooked the work camp. 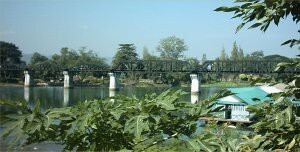 Many of the people who built the bridge, were civilians, and forced local labourers. 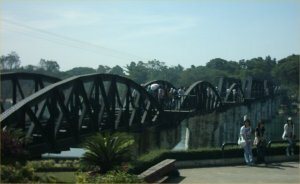 The present day bridge, built by the Thai Government. There was a tourist train that traversed the bridge every 10 minutes. The modern day bridge, taken from a different angle. I walked across the full length of the bridge, it was quite scary at times. In certain places, if you miss your footing, there is nothing to stop you falling in the River. We drove further up the railway, and then stopped for lunch, at a restaurant next to the line. We had an amazing BBQ lunch and got to sit overlooking the Kwai river, with this view. Its possible to do the trip over 2 days, and there are plenty of really good floating guest houses on the river to stay in. 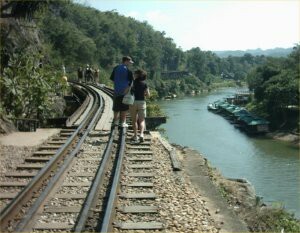 Nearby, a section of the railway, runs next to a cliff. We arranged for a driver to drive around, and meet us at the other end. It was about a mile and a half to walk. 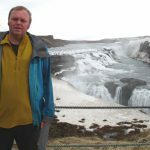 With the cliff on one side, and the river bellow, it was a pretty spectacularly experience. Half way along, there was an enormous cave dug into the cliff face, where Japanese soldiers sheltered during bombing raids. Having reached the other side. Some quick refreshments, and then a 3 hour car journey back to Bangkok, with some fascinating conversation from Jenny, her brother and our polygamous driver.